Sleeping difficulty is a common disorder characterised by difficulty initiating or maintaining sleep [1, 2], affecting approximately 10% to 20% of the general population in the USA . In a study of US adults, the number of outpatient visits identified to be due to sleeping difficulty increased from 4.9 million in 1999 to 5.5 million in 2010 . Experimental studies indicate that inadequate or fragmented sleep is associated with impaired glucose regulation in healthy young adults [4, 5]. Sleep disturbance has been shown to adversely influence metabolism and has been increasingly linked to a wide range of adverse health outcomes, including obesity , hypertension  and depression , which are all risk factors for type 2 diabetes. A number of epidemiological studies have identified that difficulty initiating or maintaining sleep is associated with a significantly increased risk of type 2 diabetes [9, 10, 11, 12]. However, it is not clear whether these associations are explained by the chronic conditions of obesity, hypertension or depression. Short sleep duration, snoring, sleep apnoea and shift work may co-occur with sleeping difficulty and associate with diabetes [13, 14, 15, 16, 17, 18]. The extent to which prior associations between sleeping difficulty and diabetes reflects confounding with these other sleep conditions is unclear. The high prevalence of both sleeping difficulty and type 2 diabetes points to a need to further understand the link between the two conditions [1, 19]. In this study, we examined the association between sleeping difficulty, defined as having difficulty initiating or maintaining sleep most of the time or all the time [1, 2], and the risk of developing type 2 diabetes based on the extracted data from two independent, well-established cohorts of US women: the Nurses’ Health Study (NHS)  and NHSII [17, 18]. We also examined the joint effect between sleeping difficulty and short sleep duration, frequent snoring, sleep apnoea and rotating shift work. Additionally, we quantified the extent to which the effects of sleeping difficulty on type 2 diabetes are mediated through BMI, hypertension and depression. The NHS  was initiated in 1976 when 121,700 female registered nurses aged 30–55 years completed a mailed questionnaire. The NHSII cohort , established in 1989, comprises 116,671 younger female registered nurses aged 25 to 42 years. The cohorts have been followed by means of biennial mailed questionnaires, which inquired about lifestyle practices and other exposures of interest, as well as the incidence of disease [17, 18]. The information about sleeping difficulty was derived from answers by participants who were actively participating in the NHS surveys in the year 2000 (n = 82,468) or the NHSII surveys in the year 2001 (n = 86,006), which was the baseline of the proposed study. For the current analysis, we excluded participants who had ever been diagnosed with cancer (n = 20,283), cardiovascular disease (n = 4,876) or diabetes (n = 7,868) at baseline, or did not respond to the questions on sleeping difficulty (n = 1,021) at baseline or were lost to follow-up after baseline (n = 1,073), leaving 133,353 women in our primary analysis. The nurses recorded ‘how much of the time during the past 4 weeks have you had difficulty falling asleep or staying asleep?’ in 2000 in NHS and 2001 in NHSII. The possible responses were as follows: ‘all of the time’, ‘most of the time’, ‘a good bit of the time’, ‘some of the time’, ‘a little of the time’ and ‘none of the time’. In the current study, we classified the participants who reported difficulty falling asleep or staying asleep ‘all of the time’ or ‘most of the time’ as having sleeping difficulty whereas the others (‘a good bit of the time’, ‘some of the time’, ‘a little of the time’ and ‘none of the time’) were classified as not having sleeping difficulty. Information on sleep duration and snoring frequency was collected in both NHS (2000) and NHSII (2001). Short sleep duration was classified as sleeping ≤6 h/day. Shift work, only recorded in NHSII at baseline, was assessed as whether the participant ‘worked permanent night shifts for 6 or more months during 1995–2001’. Information about sleep apnoea was only recorded in 2008 in NHS. Physician diagnosis of sleep apnoea and year of the first diagnosis (1997 or before, 1998–2001, 2002–2005, 2006–2007 or 2008+) were only recorded in 2008 in NHS. Type 2 diabetes cases were defined as self-reported diabetes confirmed by a validated supplementary questionnaire [17, 18]. For cases before 1998, we used the National Diabetes Data Group criteria to define type 2 diabetes. We used the American Diabetes Association diagnostic criteria for type 2 diabetes diagnosis from 1998 onwards. The validity of self-reported type 2 diabetes diagnosis in our cohorts has been previously documented in detail [20, 21]. Briefly, 97–98% cases were reconfirmed against blinded physician medical record review [20, 21]. Information on potential confounders, such as age, ethnicity, smoking status, weight, height, physical activity, menopausal status and postmenopausal hormone therapy, multiple vitamin use, regular use of medications (e.g., aspirin, antidepressants, minor tranquilisers and antihypertensive drugs), and physician diagnosis of hypertension and depression was collected via biennial questionnaires. Information on food and alcohol consumption was collected every 4 years via a validated semi-quantitative food frequency questionnaire. BMI was calculated as weight (kg)/height2 (m). Hypertension was considered as either professionally diagnosed hypertension or use of antihypertensive medications. A participant was considered as having depression if she reported physician-diagnosed depression or use of antidepressant medications. Dietary quality was assessed by the alternate healthy eating index (AHEI), based on a high consumption of vegetables, fruit, nuts and legumes, whole grains, long-chain fats, polyunsaturated fatty acids, and a low level of sugar-sweetened beverages and fruit juice, red/processed meat, trans fats and sodium. At baseline, the nurses ranked their feeling about their standing in US society in 10 levels; those at the top are the people who are the best off—those who have the most money, the most education, and the most respectable jobs, while at the bottom are the people who are the worst off—those who have the least money, the least education, and the least respectable jobs or no job, which was used as a surrogate indicator of socioeconomic status (SES). Individuals contributed person-time from the return of the baseline questionnaire (NHS, 2000; NHSII, 2001) until the date of diagnosis of type 2 diabetes, death, loss to follow-up, or the end of the follow-up period (30 June 2010 for NHS and 30 June 2011 for NHSII), whichever came first. Multivariable Cox proportional hazards models were used to estimate HR and 95% CIs of type 2 diabetes according to the ‘frequency of having difficulty falling asleep or staying asleep’. A linear trend across the categories was quantified with a Wald test. We also presented the risk of type 2 diabetes comparing women with and without sleeping difficulty (dichotomy). Multivariable models were adjusted for the baseline levels of menopausal status and postmenopausal hormone therapy use, smoking status, alcohol consumption, physical activity, AHEI, ethnicity, family history of diabetes and self-reported SES status. To examine the extent to which chronic conditions explained the association between sleeping difficulty and risk of type 2 diabetes, we estimated the magnitude of change in the regression coefficient for sleeping difficulty with and without adjustment for each individual and multiple chronic condition, including BMI, hypertension and depression history, which were updated every other year. The per cent of excessive risk explained by the chronic conditions was computed as follows: (1–[β chronic condition-adjusted multivariable model/β multivariable model]) × 100% ; where βmultivariable model referred to the basic multivariable beta-coefficient and βchronic condition-adjusted multivariable model referred to the beta-coefficient from the basic multivariable plus chronic conditions. A positive change in the regression coefficient indicates a change in the rate ratio towards the null. SAS macro %MEDIATE was applied (publicly available at www.hsph.harvard.edu/faculty/spiegelman/mediate.html). Participants were also classified according to the joint categories of sleeping difficulty and other sleep-related conditions, including sleep duration, frequent snoring (every night or most nights), rotating shift work (worked permanent night shifts for 6 or more months in last 6 years), and sleep apnoea (physician diagnosed vs not). We tested the interaction using multiplicative and additive interaction analyses . The multiplicative interaction was carried out by comparing the −2 log likelihood of the models with and without interaction term; while the additive interaction was testing by estimation of Relative Excess Risk due to Interaction . In considering the effect of potential reverse causality between sleeping difficulty and chronic conditions, we did a sensitivity analysis among a relative healthy population who had a BMI less than 30 kg/m2 without physician diagnosis of either hypertension or depression, and with neither antihypertensive nor antidepressant medications at baseline. The main analysis was based on the pooled data from the two cohorts (NHS and NHSII) after further adjusting for the data sources (cohorts). The joint effect between sleeping difficulty and shift work was only based on the data from NHSII, while the joint effect between sleeping difficulty and sleep apnoea was only based on data from NHS. We also dichotomised each sleep-related exposure, and then summed these to calculate the number of sleep-related conditions (0 to 4). In NHS, the individual sleep conditions included sleeping difficulty, frequent snoring, sleep duration ≤6 h and sleep apnoea; in NHSII, the individual sleep exposures included in the calculation of total number of sleep conditions included sleeping difficulty, frequent snoring, sleep duration ≤6 h and shift work. Data were analysed using a commercially available software program (SAS, version 9.3; SAS Institute, Cary, NC, USA), and statistical significance was set at a two-tailed p <0.05. At baseline, the percentage of women who reported sleeping difficulty (having difficulty falling or staying asleep all or most of the time) was 5.9% in NHS and 4.8% in NHSII. Sleeping difficulty was associated with a higher BMI, less physical activity, lower dietary quality score, shorter sleep duration, more frequent snoring, more common use of minor tranquillisers, more frequent excessive daytime sleepiness, higher likelihood of shift work, and higher prevalence of hypertension and depression symptoms, as shown in Table 1. We documented 6,407 cases of type 2 diabetes over a period of up to 10 years of follow-up. Women with sleeping difficulty had an increased risk of type 2 diabetes compared with women without sleeping difficulty (Table 2), which was independent of a variety of risk factors, including menopausal status and hormone use, use of multiple vitamins and aspirin, family history of diabetes, physical activity, dietary quality, alcohol consumption, SES and smoking. In the multivariate-adjusted model, comparing women with and without sleeping difficulty, the multivariate-adjusted HRs (95% CIs) of type 2 diabetes were 1.39 (95% CI 1.22, 1.59) in NHS, 1.46 (95% CI 1.30, 1.64) in NHSII and 1.45 (95% CI 1.33, 1.58) in the pooled analysis (Table 2). After further adjustment for status of hypertension, depression and BMI individually, the HR between sleeping difficulty and type 2 diabetes fell to 1.34 (95% CI 1.33, 1.58), 1.34 (95% CI 1.22, 1.46) and 1.34 (95% CI 1.22, 1.47), respectively. Adjustment for any combination of two or three pre-specified metabolic risk factors (obesity, hypertension, depression) further reduced the HR of sleeping difficulty and diabetes compared with adjustment for one factor. When we adjusted for all three factors, the HRs decreased to a value of 1.22 (95% CI 1.12, 1.34; Fig. 1). The percentage of excessive risk mediated by these three factors together was 46% (95% CI 33%, 59%). A significant interaction was observed between sleeping difficulty and shift work on risk of type 2 diabetes (p for multiplicative interaction = 0.08 and p for additive interaction = 0.04). The multivariate-adjusted HRs of shift work only, sleeping difficulty only and with both conditions were 1.27 (95% CI 1.14, 1.42), 1.40 (95% CI 1.23, 1.59) and 2.30 (95% CI 1.78, 2.96), respectively, as compared with women without sleeping difficulty and never shift work in NHSII (Fig. 2a). The interactions between sleeping difficulty and any other sleep conditions, including frequent snoring, sleep apnoea and short sleep duration were not significant (all p values for interaction >0.1; Fig. 2b–d). The multivariate-adjusted HRs of sleep duration ≤6 h only, sleeping difficulty only and with both conditions were 1.13 (95% CI 1.07, 1.19), 1.32 (95% CI 1.19, 1.55) and 1.59 (95% CI 1.43, 1.76), respectively, as compared with women without sleeping difficulty and sleep duration >6 h in the pooled analysis (Fig. 2d). To further explore whether the effect of sleeping difficulty was independent of other sleep conditions, we simultaneously included all sleep-related factors in the multivariate-adjusted analysis. The multivariate-adjusted HRs between sleeping difficulty and type 2 diabetes were 1.26 (95% CI 1.10, 1.46) in NHS and 1.28 (95% CI 1.13, 1.44) in NHS II after simultaneous adjustment for all other sleep-related factors. As compared with women without any of these sleep conditions, women who reported having one (HR: 1.47, 95% CI 1.39, 1.56), two (HR 2.14, 95% CI 1.99, 2.31), three (HR 2.84, 95% CI 2.48, 3.26) and all four (HR 4.17, 95% CI 2.93, 5.91) sleep conditions had gradually increasing HRs of type 2 diabetes (p trend <0.0001). In a sensitivity analysis, we also included all potential mediators, confounding factors and sleep conditions in a single model; the simultaneously multivariate-adjusted HR between sleeping difficulty and type 2 diabetes was 1.18 (95% CI 1.08, 1.29). Among the relatively healthy population without obesity, hypertension or depression at baseline (n = 82,903, 62% of the sample), the multivariate-adjusted HRs of type 2 diabetes during up to 10 years of follow-up were 1.44 (95% CI 1.23, 1.74), comparing women with and without sleeping difficulty after adjusting for lifestyle factors, SES and baseline BMI, which decreased to 1.33 (95% CI 1.11, 1.59) after further adjusting for incident hypertension, incident depression and updated BMI. The percentage of excessive risk mediated by these three factors together was 21% (95% CI 9%, 41%) among this relatively healthy population. In two large prospective cohorts of US women with up to 10 years of follow-up, sleeping difficulty was significantly associated with type 2 diabetes, independent of lifestyle and other sleep-related factors. Our mediation analysis suggested that this positive association was only partially explained by hypertension, BMI and depression. The combination of sleeping difficulty and other sleep conditions including frequent snoring, sleep duration ≤6 h, sleep apnoea and shift work was associated with a particularly high risk of diabetes. This paper extends the findings of previous studies in two important ways. First, it is the first study to examine and quantify the mediation effects of chronic conditions on the association between sleeping difficulty and type 2 diabetes. Second, it is the first one to examine the joint effects and test the interactions between sleeping difficulty and other sleep-related conditions on the risk of type 2 diabetes. The findings provide evidence to clinical physicians and public health researchers for future diabetes prevention among a high risk population with multiple sleep disorders. Our finding that sleeping difficulty is associated with a higher risk of type 2 diabetes is consistent with previous studies. So far, six studies have addressed the impact of self-reported difficulty falling or staying asleep and the risk of type 2 diabetes [9, 10, 11, 12, 24, 25, 26]. Half of these studies found a significant positive association between difficulty initiating sleep or maintaining asleep and the risk of type 2 diabetes [10, 11, 12, 24, 25], with significant pooled results: 1.57 (95% CI 1.25, 1.97) for difficulty initiating sleep and 1.84 (95% CI 1.39, 2.43) for difficulty in maintaining sleep . Our estimation of 1.45 (95% CI 1.33, 1.58) for sleeping difficulty is quite close to the estimation in the above meta-analysis. Our study is, so far, the largest study of sleeping difficulty and type 2 diabetes. Besides the main effects of sleeping difficulty, we also modelled separately with and without different chronic and sleep conditions to explore potential mechanisms. Several potential mediating pathways were analysed in this study, specifically obesity, hypertension and depression. Sleeping difficulty may influence metabolism and produce obesity by disturbing circadian rhythms and other physiological function [27, 28, 29]. Sleep restriction has been shown to be obesogenic, perhaps by altering appetite-regulating hormones , which could induce unwanted weight gain  and eventually increase the risk of diabetes. Sleep disturbance is also associated with hypertension  by increasing blood pressure and sympathetic nervous system activity , which may influence insulin sensitivity. As both obesity and hypertension are associated with sleeping difficulty and are risk factors for type 2 diabetes, exploring the potential mediation effect of obesity and hypertension may be helpful for understanding the pathway from sleeping difficulty to type 2 diabetes. Another important factor is depression. Sleep complaints are common in depression , and are included in the definition of depression in some cohort studies examining the association of depression and diabetes. Previous studies have shown that depression increases the risk of type 2 diabetes . Our mediation analysis indicated that the sleeping difficulty to diabetes association we identified did not depend exclusively on any specific individual factor or combination of hypertension, BMI or depression; together they explain half of the effect of sleeping difficulty on the risk of type 2 diabetes. The unexplained risk might be caused by other pathways, which warrant future studies. Other potential pathways that were analysed in the current study were sleep conditions accompanied with sleeping difficulty, specifically short sleep duration, frequent snoring, sleep apnoea and shift work. Sleep continuity is considered to be important for normal metabolic function by modulating or controlling daily patterns in human physiology [27, 28, 29]. One of the most common complications of difficulty falling or staying asleep is a reduction in night-time sleep [13, 14]. In our cohorts, more than 60% of women with sleeping difficulty (defined as all of the time or most of the time) slept less than 7 h per day, which occurred in only 15–24% of women without difficulty falling or staying asleep. Experimental sleep restriction reduces glucose tolerance compared with a fully rested condition . A recent meta-analysis of ten prospective studies reported an association between short sleep and incident diabetes of 1.33 (95% CI 1.20, 1.48) . In our analysis, sleeping difficulty and short sleep duration were independently but also jointly associated with a higher risk of type 2 diabetes. Our previous analysis found a significant positive association between short sleep duration, regular snoring, and rotating shift work and the risk of diabetes [17, 18]. When we added all of the sleep conditions into the model together, the association between sleeping difficulty and risk of type 2 diabetes was attenuated but remained significant, which implied that the pathway between sleeping difficulty and diabetes overlapped partially (but not fully) with other sleep conditions. The present study indicates a particularly high risk of diabetes when sleeping difficulty is combined with other sleep conditions such as short sleep duration, snoring, sleep apnoea and shift work, indicating that these conditions may exacerbate the adverse effects of each other. Experimental studies have indicated that not only the quantity and quality of sleep, but also the timing of sleep has an effect on glucose regulation . The relative decrease in insulin sensitivity following circadian misalignment and sleep loss was nearly twice as large (−58%) as that following the aligned condition (without circadian misalignment) with the same degree of sleep loss only (−32%, p = 0.01) . Epidemiological studies have also consistently observed significant associations between shift work and the risk of type 2 diabetes. A recent meta-analysis of twelve studies reported a pooled odds ratio of 1.09 (95% CI 1.05, 1.12) between ever exposure to shift work and the risk of diabetes. 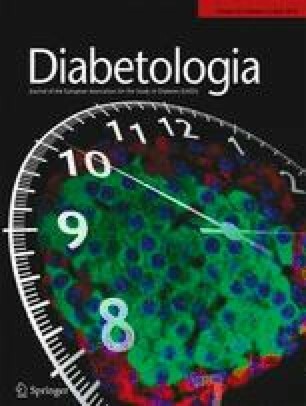 In our study, shift work and sleeping difficulty jointly associated with the risk of type 2 diabetes in a manner that was more than additive, which implied that more diabetes cases would occur in women with sleeping difficulty who worked in a shift schedule than in women with only one or the other of these two risk factors. This result is consistent with a recent finding in the NHSII cohort that chronotype (preferred sleep timing) is associated with type 2 diabetes risk, and rotating night shift work significantly modified this effect, with the lowest risks for early chronotype individuals working daytime schedules and late-type chronotype individuals working schedules including night shifts . Strengths of the present study include the large number of incident type 2 diabetes cases, long-term follow-up, consistent findings across two separate cohorts and updated comprehensive information on potential confounders and mediators. Several limitations also warrant consideration. First, assessment of sleeping difficulty was based on self-report, and we did not assess sleep difficulty-related daytime impairment. Objective measurements of sleep onset, maintenance, sleep duration and sleep quality were not available. Sleeping difficulty may occur secondary to obesity  or be associated with use of antihypertensive or antidepressant medications. Similarly, it is possible that individuals had sleeping difficulty as a result of undiagnosed depression and that the depression was a residual confounder. We adjusted for these factors, although we cannot totally exclude the potential for residual confounding. A sensitivity analysis among a healthy population without these factors, however, provided a similar estimation of the magnitude of the sleeping difficulty and diabetes association. In addition, our cohorts included mostly white women, potentially limiting the generalisability of the findings. However, the relative homogeneity of the study populations in educational attainment and SES enhances the internal validity. In conclusion, this study shows that sleeping difficulty is associated with type 2 diabetes, which is partially explained by associations with hypertension, BMI and depression symptoms; the association is particularly strong when combined with other sleep disorders. Our findings highlight the importance of sleep disturbance in the development and prevention of type 2 diabetes. We are indebted to the participants in the NHS and NHSII for their continuing outstanding support and colleagues working in this study for their valuable help. The Study was supported by NIH grants UM1 CA186107 and UM1 CA176726. The authors declare that there is no duality of interest associated with this manuscript. JWW has received research grant and lecture/other fees from NeuroMetrix (grant only), UCB and Xenoport and SR has received a research grant from Jazz Pharmaceuticals. All have no duality of interest with the current study. FBH was involved in the conception and design, provision of study materials or patients, the collection and assembly of data, and obtained funding for the study. YL, XG, JWW, EMC, CLJ, ASW, ES, SR and FBH contributed to the analysis and interpretation of the data. YL produced a draft of the article. YL, XG, JWW, EMC, CLJ, ASW, ES, SR and FBH were involved in the critical revision of the article for important intellectual content. YL, XG, JWW, EMC, CLJ, ASW, ES, SR and FBH approved the final article. YL and FBH provided statistical expertise. YL and FBH are responsible for the integrity of the work as a whole.